Andromium Superbook, a tech startup has gone beyond the $2 million dollar mark for its smartphone invention Superbook in its online campaign to fund its project. Andromium Superbook will be the point of connection between any Android smartphone and your laptop computer. What you end up getting is a bigger screen, a hardware keyboard and over 8 hours of battery life. It even charges your phone as long as it’s docked via the USB cable. The Andromium Superbook doesn’t actually have a processor inside of it, it uses all of the capabilities of your phone. It’s actually a smart laptop shell that when plugged in turns your laptop computer into a fully functioning computer. You can connect the latest smartwatches and fitness tracker with this so that you can monetize your fitness as well as all the facilities of a smartwatch. So the processing power, the Wi-Fi, the Internet and all of your other applications will be coming from your smartphone. As stated earlier, it provides you with an extended keyboard, a monitor, and charging capabilities for your smartphone. So if nothing else it could serve as an external battery pack for your phone. It has the keyboard and monitors just like a normal laptop and it acts like a normal laptop. So you’re not going to be able to have a touch interface on the screen to be able to control things. You’re still going to be clicking on the keyboard and using the trackpad to control the mouse. The Andromium Superbook uses an OS onboard that allows it to have that connection with your phone called the Andromium. The Andromium OS app can be downloaded by going to the Google Play store. Once you have it downloaded, take the USB cable that’s attached to your Superbook and simply plug it in. It powers your laptop on and your Superbook will be ready for use. It’s a unique interface in that it connects your smartphone and laptop but it doesn’t exactly mirror your phone. It actually converts it in a way that would be very similar to a laptop. This makes it special because the need for upgrading the device is virtually none. So when it’s time to upgrade your phone the device will also upgrade because it’s an accessory to your phone. The Andromium Superbook’s low price is made possible because it doesn’t actually have any storage, memory or a processor inside. It’s just a shell or more like a QWERTY keyboard, a battery, a multi-touch trackpad, and a display. All of the real work is being handled by your smartphone. Many companies have made it their mission to try and make your smartphone the last computing gadget you’ll ever need to carry around in your pocket or purse. Andromium however, realized that to make this have a chance of becoming a reality that you’d have to have access to not only a larger screen but also a full-sized keyboard as well. This was the principal reason for the creation of the Superbook. Once your smartphone is connected via cable the Andromium app handles everything else from that point. The interface will probably remind you of Windows but it is definitely Android. All of Microsoft’s Office applications can be run along with any files you need as long as they exist on your phone. The features of the Superbook are 11.6 inches, 1366 x 768 pixel TN display with Android navigation keys. 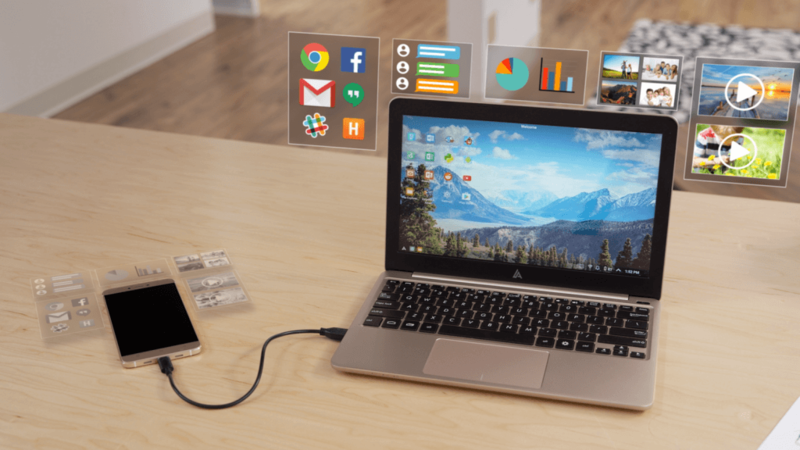 In order to use the Superbook, your device must be equipped with Android 5.0 or later with at least 1.5 GB of RAM, a dual-core processor and at least 25MB of free storage space. It was mainly created to be used with your laptop computer but you can also use it with Android and Windows tablets. You’ll need a device with Android 5.0 or later, at least 1.5 GB of RAM, a dual-core processor, and at least 25MB of free storage space to use the Superbook. Sure the Superbook is a fraction of the cost compared to if you were to go out and buy a brand new computer. But one drawback about the Superbook is that it is only available for Android users so if you own an iPhone then you’re out of luck. This isn’t going to be the product for you. The Superbook is probably not going to replace your laptop if that’s what you were really expecting it to do. It won’t totally eliminate all of the restrictions that hold smartphones back. Essentially you’ll be carrying around another device so that ends up powering your device just so it can be a secondary keyboard and monitor for your smartphone. It does have the OS that brings over some of the data and makes it feel like a laptop. However, It doesn’t provide you with any additional computing power that you don’t already have on your phone. It also has a limit of restrictions based on the number of apps you currently have installed on your phone. So if it’s not a mobile app then you won’t be able to use it on this device. If you’ve had some games that you like to play or other things that you do on your laptop you won’t be capable to use them because if they don’t already exist on your smartphone. You’ll have to evaluate how the Superbook is going to fit into your life, whether it does or it doesn’t. Android does have a ton of apps that lend themselves well to laptops such as writing documents using Microsoft Word, watching videos on YouTube and playing a lot of games. But since the Superbook’s display isn’t touchscreen it may take some getting used to. Either way, taking into consideration how much you’re able to do with your smartphones today the Superbook may finally be the first computing device that makes your phone the only other device that you’ll need carry along with you. Andromium has even promised to open up its SDK so app developers can configure their apps to work with Andromium Superbook but that is something that remains to be seen somewhere down the road.